This page documents the several different air-powered mass accelerators I have constructed over the years for science. 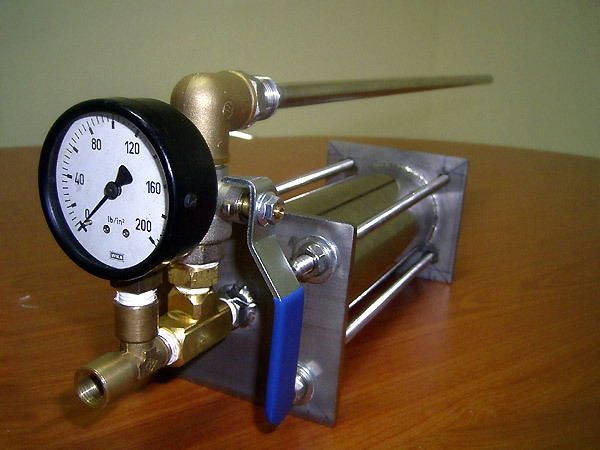 I created another page for my first pneumatic air cannon (Air Cannon TFI), which details comprehensive construction details and theoretical calculations for muzzle velocities and energies. You can check it out here. 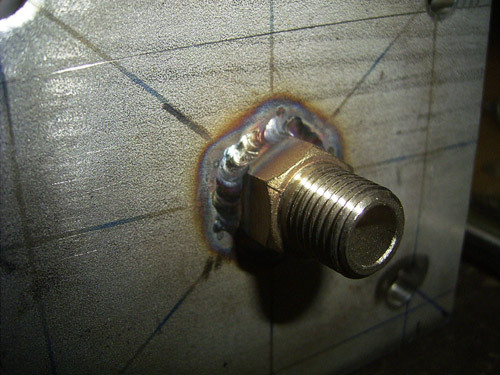 I didn't create an individual page for my subsequent air-powered devices as the construction techniques are mostly similar. Here you will find photos, information, as well as details regarding performance of the devices. Videos are also available for download. 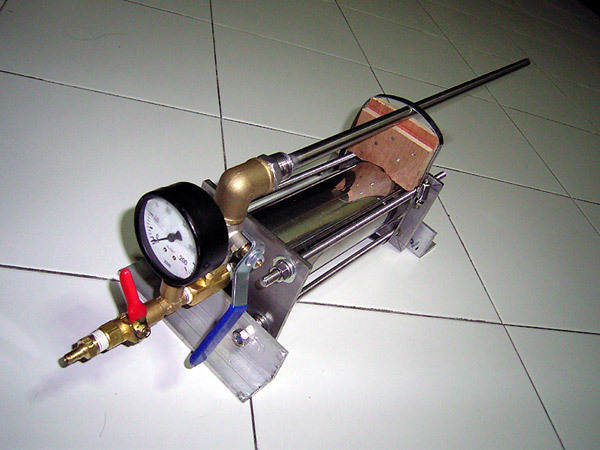 An air cannon, or pneumatic cannon, is usually a large bore device that uses air pressure to propel an object. You might have heard of spud guns, or combustion guns - these are different. 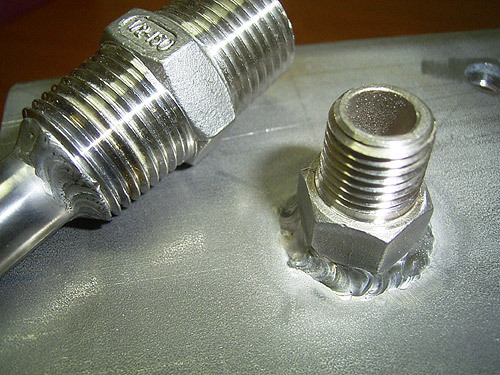 They are pipe cannon devices, using hair spray, ether, or other volatile, flammable propellants, which is ignited by a spark causing rapid expansion propelling the projectile out. Pneumatic variants are usually more powerful and more predictable as exact PSI measurements can be taken and controlled, and higher PSI levels ( more than 100psi ) can be achieved (compared to 20 - 40psi for most combustion type guns), yielding more power whilst being safer to operate. 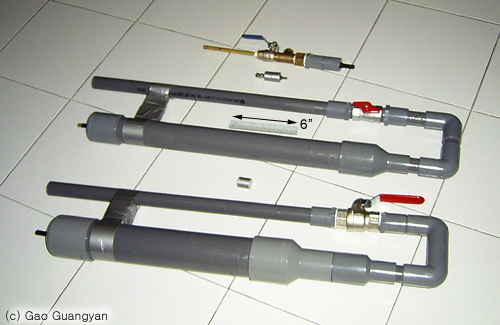 Here are some assorted cannons I made shortly after construction of air-cannon TFI. 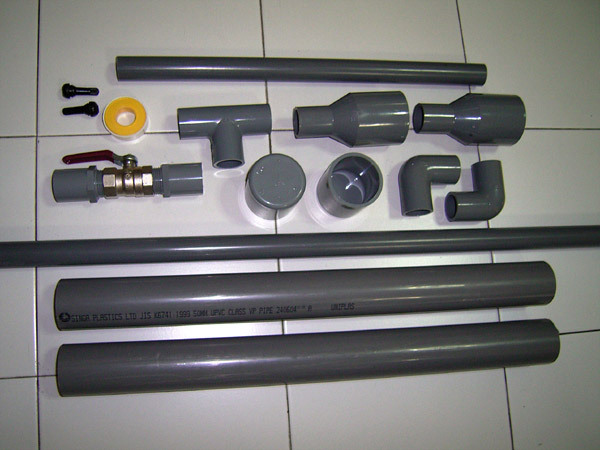 The first photo shows 3 cannons, 1 small one (was later disassembled for use in another project), air cannon TFI, and a similar cannon with a larger air-tank and a better valve (made for a friend). Performance is slightly better than air cannon TFI due to the improvements. The small one was originally intended to be a small ultra-high pressure mini-gun but I decided that it wasn't practical so it was disassembled. The 2nd photo shows a small compact air-cannon with a 1/2" valve, a 12" ruler, a can of mountain dew for size comparison, and air-cannon TFI. The small air cannon is still quite powerful, yet being small and compact. Also made for a friend. 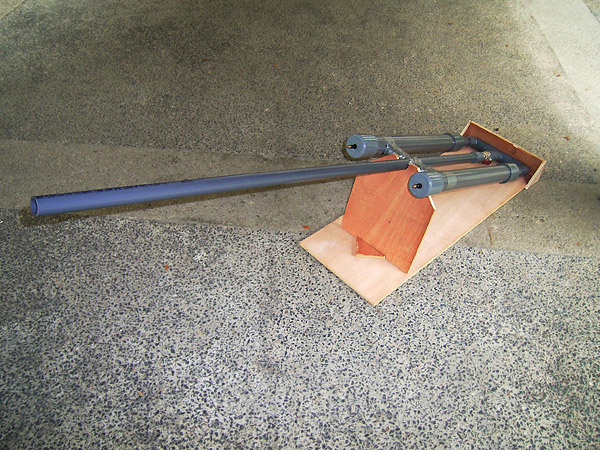 This propulsion device was constructed for a school competition, whereby the aim was to launch a projectile to a fixed distance of 80m. Design is largely the same as Air Cannon TFI, except that two 2" Air tanks are used and a 5 foot long barrel was used. 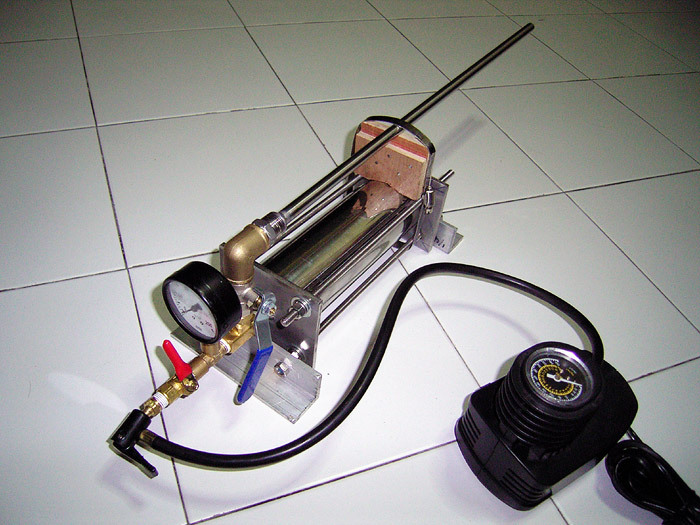 The cannon features two valves for faster pumping using two separate bicycle pumps. Needless to say it accomplished the task easily by firing a 10cm long 1" dia aluminum projectile accurately and consistently (we won the competition), at only ~15psi (If I remember correctly). A wooden base was constructed out of plywood. I tested the device in a large field and fired it at 70psi and it fired the projectile clear over the trees and disappeared... I estimate over 300m. 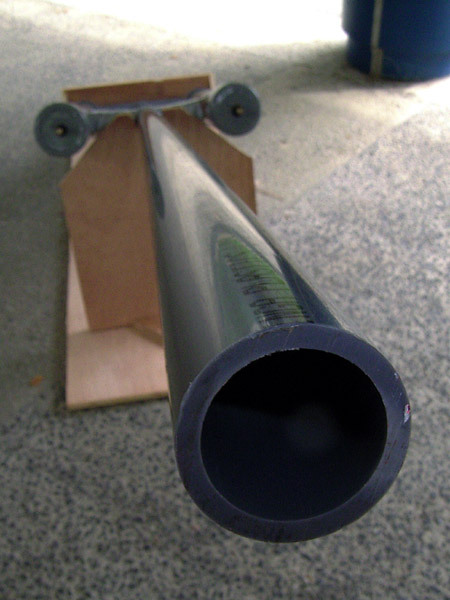 The device is constructed out of high-pressure PVC pipe (rated to 20bar) so there is still much potential to be tapped out of this cannon! This cannon is extremely powerful, and amazingly accurate, due to the long barrel. A splendid performer. The school agreed to pay for the materials in exchange of the cannon so it now resides in the physics lab in my school. I didn't manage to do any velocity tests with this cannon before I passed it to the school but theoretical calculations suggest that supersonic velocities are possible with high pressure (over 100psi) with light projectiles (perhaps wood projectiles, or small aluminum ones). In a quest for higher velocities, yet still being safe, a strong, all metal air cannon was made. Stainless steel was chosen for its aesthetics, strength and anti-corrosive properties. 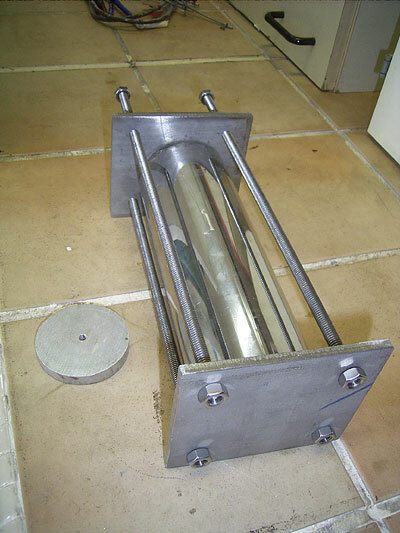 The air tank is made from a thick-walled stainless steel pipe, which is welded to two 6mm thick stainless steel plates, and then further held down by 4 M8 threaded rods and 8 nuts. This tank is very strong and I have no doubt it can hold a few hundred psi with ease. A hole was drilled into one of the stainless steel plates and a stainless steel pipe fitting was welded down. Most parts of the cannon is made from stainless steel, expect some brass pipe fittings. A 1/2" ball valve acts as the main trigger. To support the barrel, a wooden support was made and held down with a large hose-clip. (This is temporary and will be replaced with a plastic one instead). A 200psi gauge was fitted. This can be easily changed but since I have no equipment to pump it higher than 200psi, It will do for now. 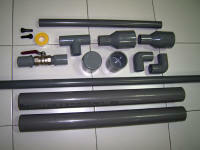 A bicycle pump valve is fitted to allow pressurization via a bicycle or car tire pump. Seen in the 3rd photo is a small 12VDC air pump which can pump to 300psi, but I do not want to stress it and risk spoiling it, so I'm only using it to 200psi max. It is however very slow and noisy so an alternative method is required. A 3cm long 9.5mm dia. 5.75g aluminium projectile was used as projectile. (The fitting is however quite loose... a tighter fitting projectile would certainly be more effective). This was placed into the barrel and the tank was pressurized to 120psi. Velocity is measured to be 85.14m/s and 87.12m/s on two separate shots. I used the acoustic method to calculate the velocity. 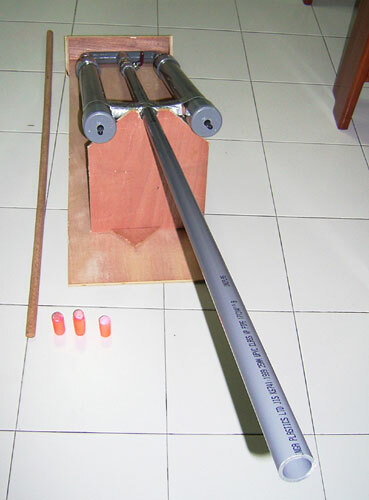 The muzzle of the barrel was placed at a measured distance from an aluminium target board, and a microphone was placed near the muzzle. When the device is fired, there will be two distinct sounds, one from the muzzle when the projectile leaves the barrel and another when the projectile hits the target. As such, it is possible to determine the duration of the shot. Since the duration and distance of the projectile flight is known, taking into account the speed of sound, it is possible to calculate the projectile velocity using some simple math.